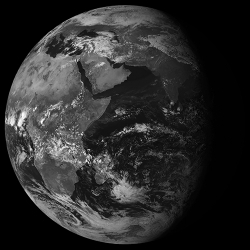 The final command was sent at 09:00 UTC on 11 April, ending the service record not only of one spacecraft, but of the whole Meteosat first-generation mission begun by the European Space Agency in 1977. Launched on 2 September 1997, Meteosat-7 was designed to fill the gap between the Meteosat Operational Programme (encompassing Meteosat-4 to -6) and the first satellite of the second generation, Meteosat-8 (launched on 28 August 2002). For the past decade, it has delivered observations of the Indian Ocean from geostationary orbit. After the December 2004 Indian Ocean tsunami, Meteosat-7 became an essential part of the tsunami warning system, acting as a relay spacecraft for tsunami warning buoys.